0-12 weeks. Until a puppy has completed its course of vaccinations, there is a risk of infection. Therefore, it is usually better that exercise is restricted to within the confines of your garden. Exercise in the garden also provides an excellent opportunity to start early training, and to get your puppy used to wearing a collar. Your puppy can be taken out to see things but should not be allowed to walk on the floor where it could potentially pick up harmful infections or diseases. Parvo is a killer and easily transmitted, there has been outbreaks in differing parts of the country. Lepto and other diseases can also be picked up easily at a young age. It will be sufficient to play with your puppy in the garden at this stage with safe, large toys, do not throw toys so that the puppy breaks to a halt trying to pick them up, this can damage joints, the damage done will be irreversible, lots of steps/stairs at a young age is to be avoided. 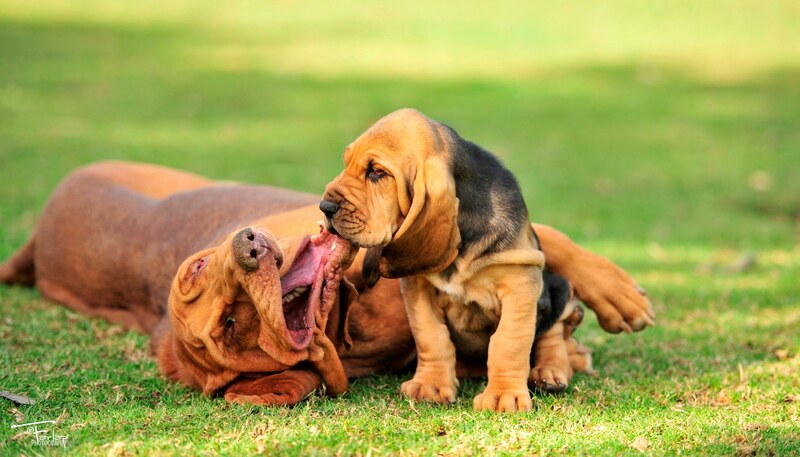 Do not rough play with your puppy, rough playing does not teach your puppy any boundaries, it may be cute for them to nip and tug at things when they are small but it is not so cute as they get bigger, Bloodhounds can be stubborn creatures so any habits that are created can be hard to undo. If you have older dogs it is great that they play with each other but be careful that your puppy does not overdo it as the older dog may be a bit rough and hurt your puppy unintentionally, older dogs can also sustain longer periods of exercise/activity. It is very important that your puppy gets sufficient rest, after breakfast and some time awake they will need to sleep for a few hours, after lunch they will sleep again probably of their own accord, if not they may need some cage rest, they must be trained to go in a cage and not be scared of it. Cages are also useful for separating dogs and puppies so the puppy can rest and the older dog can have some time out. You should never exercise your puppy on a full stomach as this may contribute to bloat or stomach dilation which can prove fatal. When walking your puppy this is not done at your normal speed, this is done at the puppy’s speed which will be a mere amble to begin with. 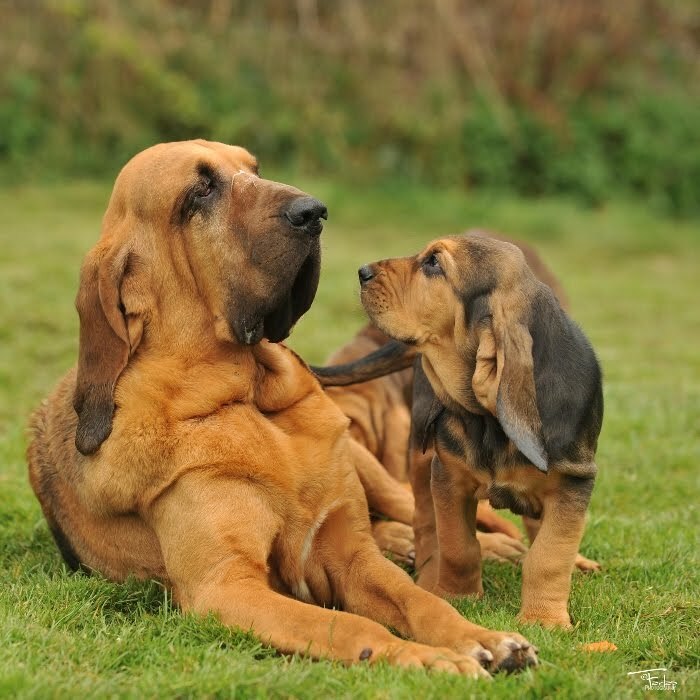 It is important not to overdo any exercise whilst you Bloodhound puppy is growing, joints can be damaged causing arthritis later in life. The above walks are additional to play in the garden, again do not let them overdo it in the garden, if they have spent a longer active time in the garden then they may not need to go out for a walk as they have had sufficient exercise already. If they get over tired they can go a bit hyper, if they get hyper put them quietly in a cage so they can go to sleep. Toys, treat balls and training are great activities to tire their minds out and keep them entertained; they are quite responsive to clicker training and this sharpens their commands up. Do not let your puppy pull on the lead; it is easier to correct them when they are younger than when they are a 9 stone adult!! If they continue to pull you can use a dog head collar, Dogmatic ones are the best, this need to be introduced gradually so that they can get used to it. If you are going to show or work your puppy small 5 minute sessions at 4 months can be started of standing and being on a slip lead or show chain, playing hide and seek in the garden, for this teach them a command “find it”, this can be started by placing bits of food on the floor and getting them to search for it...they will soon learn to use their nose...it comes naturally. · Remember a 20 minute walk at a normal pace is approx 1 mile long. · Your puppy will need to be kept leashed in parks and insecure areas, if you want to let your puppy off the lead you will need to find a fully enclosed area that is stock fenced, as the puppy grows it will get faster and you will not keep up with it, if it picks up a scent it will be gone. · For insecure areas use long training leads or horse lunging ropes, whatever you use it will need to be strong. On leashes and long ropes we always give the stitching and clips a quick check before every use to ensure they are still safe. Also use a second clip for added security as one clip has been known to twist and release. · Always remember do not feed your puppy or adult hound before or after walks/exercise, leave a gap of two hours before or after exercise, also when travelling feed at least an hour before or after travelling and maybe a lighter meal instead of a full one. · Do not exercise in long grass that is seeding, seeds can get in their eyes, throat and pierce the paws, they can also track into the body, long grass can also be a host to ticks. · Do not walk your puppy or hound in hot weather, if they are outside sunbathing do not leave them in the direct sun for an excessive amount of time, they can soon get heat stroke, heat stroke is dangerous and can kill. · As dogs enter in to old age they tend to slow down, they will still enjoy walks but probably at a slower pace and a shorter length.